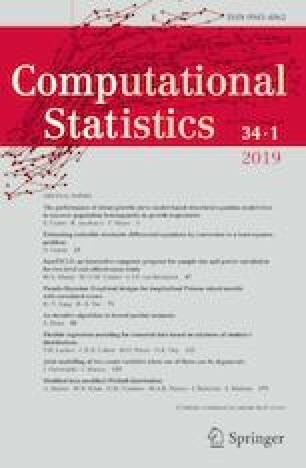 This paper discusses the kernel estimator of conditional density. A significant problem of kernel smoothing is bandwidth selection. The problem consists in the fact that optimal bandwidth depends on the unknown conditional and marginal density. This is the reason why some data-driven method needs to be applied. In this paper, we suggest a method for bandwidth selection based on a classical maximum likelihood approach. We consider a slight modification of the original method—the maximum likelihood method with one observation being left out. Applied to two types of conditional density estimators—to the Nadaraya–Watson and local linear estimator, the proposed method is compared with other known methods in a simulation study. Our aim is to compare the methods from different points of view, concentrating on the accuracy of the estimated bandwidths, on the final model quality measure, and on the computational time. The research was supported by Grant Agency of Masaryk University grant No. MUNI/A/1503/2018, and, moreover, by the project of specific university research at Brno University of Technology FAST-S-19-5878.